YES, they pulled it off. 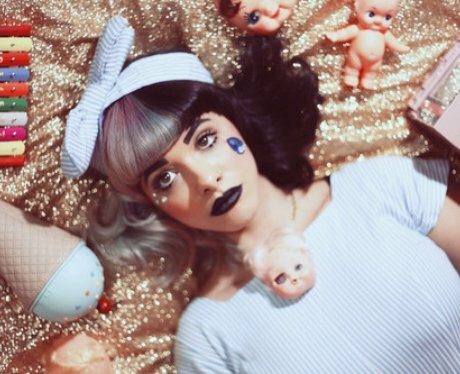 Of course Melanie Martinez can perfectly pull off black lipstick. Is there a time when she hasn't nailed an unconventional look? Yas, baby queen. Rihanna rocked this iconic dark lip look at the unveiling of her 'Anti' album art. If anyone ever tells you that black lipstick looks bad, please show them a Powerpoint presentation that just consists of this image. If anyone knows how to serve a goth adjacent glam look, it's Marina Diamandis. Show me a Jenner/Kardashian sister and I'll show you someone who isn't afraid to be adventurous with a lip colour. Lily Collins' black lipstick makes her look like a futuristic french spy. Needless to say she nails it. Halsey has one of those faces that look good in ANY colour lipstick, eyeshadow, or blush. She could melt down a green crayon and wear it on her lips and it would look phenomenal. Rena Lovelis of Hey Violet manages to give a bold lip, strong cat eye, and bright hair...all while looking like perfection. No flaws detected, guys. Does anyone else have Beyoncé's acting part in 'Telephone' memorised? Oh, just me? That's fine. Look at this lip colour. An icon. When has Gigi Hadid ever looked bad? That's right. Never. Why would Gigi wearing black lipstick be any different? OF COURSE she nails it.